The Friends’ Club and Library of Barpeta’s Muslimpatti felicitated 30 students, who have excelled in the High School Leaving Certificate (HSLC) and Higher Secondary School Leaving Certificate (HSSLC) Examination this year along with two players of Barpeta district during a felicitation and interactive programme organised by the club at Barpeta Town High School on Sunday. Well-known physician Dr Sayed Ahmed Jadid presided over the felicitation programme. 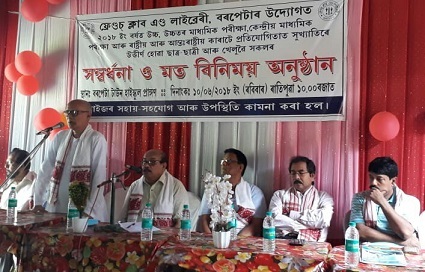 Bhella Higher Secondary School principal Ramendra Kumar Das, teacher Abdus Samad Ahmed, advocate Lutfar Rahman and Barpeta Town High School headmaster Najibul Haque were present in the programme. Sultana Aishah Siddika and Shyamolina Pathak, who secured third and ninth positions respectively in the HSLC Examination, 2018 from the district, were also felicitated in the programme. Besides, national level karate player Hani Ali and Sarhan Rashul were also felicitated in the programme. Friends’ Club and Library president Minara Aktara Ahmed and cultural secretary Imdadul Hussain were also present at the event.